Director – Franklin J. Schaffner, Screenplay – Rod Serling & Michael Wilson, Based on the Novel Monkey Planet by Pierre Boulle, Producer – Arthur P. Jacobs, Photography – Leon Shamroy, Music – Jerry Goldsmith, Photographic Effects – L.B. Abbott, Art Cruichshank & Emil Kosa Jr, Makeup – John Chambers, Art Direction – William Creber & Jack Martin Smith. Production Company – Apjac/20th Century Fox. A space mission that left Earth in 1972 crashlands on an alien planet. Due to Einsteinian relativity, it is now the year 3978. The three surviving crew led by Captain George Taylor trek across a desert. They come to a civilisation only to discover that on this planet humans are dumb and the culture is ruled by talking apes that regard humans as mere animals. Taylor is captured and taken to the Behavioural Science laboratory of the chimpanzee scientists Cornelius and Zira. He becomes a cause celebre when it is discovered that he can talk. However, Taylor’s existence becomes a threat to the Minister of Science Dr Zaius who wants evidence of his existence eliminated to protect ape society. This is the film that started off the money-spinning series. Planet of the Apes was one of the biggest science-fiction successes in the period before Star Wars (1977) and the era of the science-fiction blockbuster. It produced a then unprecedented four sequels, two tv series spinoffs, a remake and a reboot series of films (see below), even a popular Marvel comic-book. Planet of the Apes was an adaptation of an up until then not-so-well-known novel Monkey Planet (1963) by French writer Pierre Boulle, who was best known for the book that became the basis of The Bridge Over the River Kwai (1957). As has been snidely noted in regard to both River Kwai and Planet of the Apes, Pierre Boulle’s books tend to make better films than they read as novels. Monkey Planet tells the same story as Planet of the Apes but in a heavy-handed and polemic way. 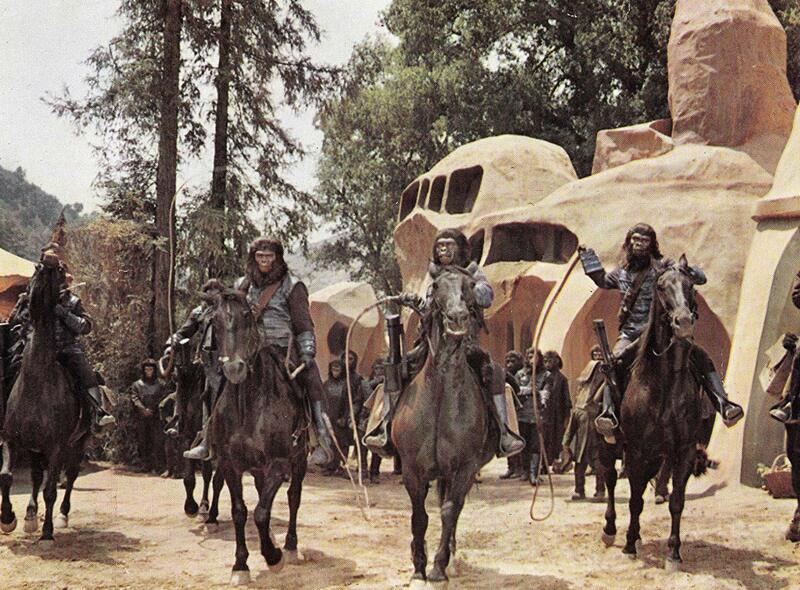 Planet of the Apes may be a rare case of the film adaptation having fine-tuned and refined the themes of the book. The script for the film comes from Michael Wilson, a screenwriter who was blacklisted during the 1950s (who had also uncreditedly worked on the script for River Kwai), and Rod Serling, who became a genre legend as the creator, host and principal writer of tv’s genre landmark The Twilight Zone (1959-63). After the cancellation of The Twilight Zone, Rod Serling began to take on film script work, delivering works that had a strong and ardent political voice with the likes of Seven Days in May (1964) and The Man (1972). The early scenes here with Charlton Heston delivering a series of lengthily embittered comments on the human condition are pure Rod Serling, run through as they are with the frequent pessimism about the human condition that beset much of The Twilight Zone and certainly dragged down Serling’s later series Night Gallery (1969-72). (It appears that Rod Serling delivered the early draft of the script – a much more elaborately scaled version, which was closer to the book, and featured the apes living in a technological world analogous to our own – and that this was later rewritten by Michael Wilson). Planet of the Apes is not exactly a believable scenario. Indeed, it may count as one of the most incredulous uses of astronauts failing to question the fact that they are on an alien planet and encounter aliens who just happen to speak English. The twist ending is a classic, no doubt – in fact, it is probably one of science-fiction cinema’s most potent and haunting images – but in retrospect is it any surprise? Nevertheless, what must be said is that Rod Serling, Michael Wilson and particularly director Franklin J. Schaffner do much to make the basic premise believable. Planet of the Apes could easily have toppled over into a cute, gimmicky one-gag novelty. However, any idea that the film is going to be a cute jokey treatment is dispelled the moment we first see the apes – riding on horseback, shooting at and hunting the humans, then standing over the slaughtered bodies to pose for photos. These scenes are directed with a dramatic urgency with the camera perpetually on the move and make for a bold, exciting beginning. In the middle of the film, the tone changes. The violence of the early scenes is replaced by social satire. Sometimes the satire does not always sit easily. At its worst, it is merely gimmicky mimicry with people in ape masks satirising human religious services, posing for photos and particularly the apes doing a ‘See No Evil, Hear No Evil’ gag at the trial. (This latter was in fact a shot that was ad libbed on the set and kept in after the dailies made people laugh). 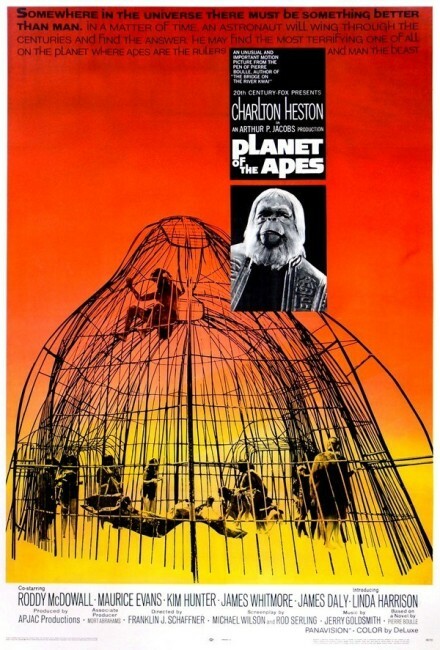 At its best, Planet of the Apes swings a giant satire on the Scopes Monkey Trial, biting at religious fanaticism with a vehemence and in the end turning around to use the apes to deliver an embittered comment on the human condition. Rod Serling and Michael Wilson hit their stride during the trial scenes and particularly the dialogue put into mouthpiece character of Dr Zaius, which has a literacy that ranks among the best of screen science-fiction. Planet of the Apes is an extremely well made film. The director was Franklin Schaffner, who had previously made the Mediaeval epic The War Lord (1965) and would go onto big-screen historical dramas such as Patton (1970), Nicholas and Alexandra (1971), Papillon (1973) and one other science-fiction film The Boys from Brazil (1978). The opening scenes have some beautifully expansive widescreen photography. The Death Valley locations evoke the atmosphere of an alien planet with stunning regard and the eerily atonal Jerry Goldsmith score makes a hauntingly evocative background to the scenery. The performances are all excellent. The usually stocky, inexpressive Charlton Heston even gives a fine performance as Colonel Taylor. Roddy McDowall and Kim Hunter give charmingly chirpy performances and Maurice Evans is excellent as Dr Zaius. There were four sequels to Planet of the Apes:– Beneath the Planet of the Apes (1970), Escape from the Planet of the Apes (1971), Conquest of the Planet of the Apes (1972) and Battle for the Planet of the Apes (1973). All but the last are well worthwhile. 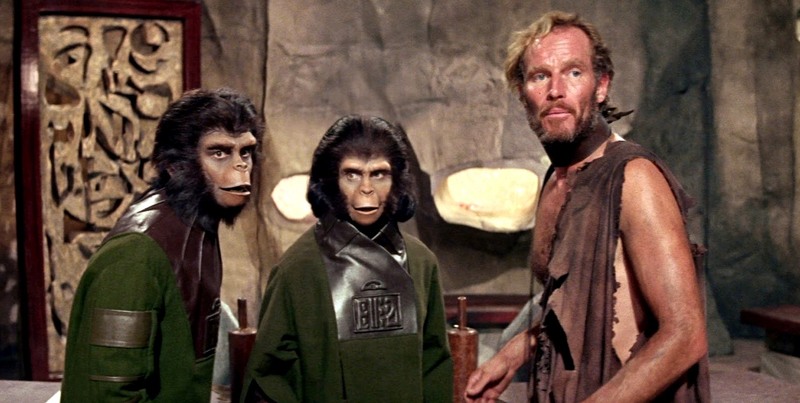 The series was subsequently spun off into a tv series Planet of the Apes (1974), which only lasted one season and was occasionally better than many dismiss it as. This was followed by an animated series Return to the Planet of the Apes (1975). Roddy McDowall played three different chimpanzees throughout the different incarnations, appearing in all except Beneath and the animated series. The films established arguably the most elaborate Future History of any science-fiction film series, although both tv series disrupt the continuity established by the films. The film was remade as Planet of the Apes (2001), which was regarded with general disappointment,. This led to reboot series Rise of the Planet of the Apes (2011), Dawn of the Planet of the Apes (2014) and War of the Planet of the Apes (2017) that started with how the apes became intelligent. Behind the Planet of the Apes (1998) is a documentary that traces the making of the series in some detail. The film, especially the ending, has been parodied in Spaceballs (1987), Hell Comes to Frogtown (1987), Madagascar (2005), The Haunted World of El Superbeasto (2009) and The Lego Movie 2 (2019), even an episode of The Simpsons (1989– ).